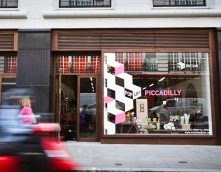 "PopUp Piccadilly is reopening the shop in The Crown Estate’s St James’s Gateway redevelopment it ran for six weeks over the summer. During that time 50 start-ups gained a week’s worth of experience trading from one of central London’s premier retail destinations. The £100 million St James’s Gateway redevelopment, a joint venture with the Healthcare of Ontario Pension Plan, is the first scheme to be delivered as part of The Crown Estate’s £500 million investment programme for the St James’s, designed to enhance the area’s reputation as a destination for quality shopping. The scheme is set to welcome internationally renowned fashion brands such as Tiger of Sweden, Royal Warrant holder Grosvenor Shirts and Barbour International over the coming months. Pop up Britain offers short-term opportunities to start-ups and micro businesses from all over the UK. It is part of a pioneering initiative aimed at matching online retail start-ups with empty high street shops. The scheme, which is backed by private sector funding, also has places in the run up to Christmas at its shops in Ashford in Kent, Chard in Somerset and Dunstable in Bedfordshire. Mark Williams, head Intuit UK Business, said: "The UK’s economic recovery will be driven by the success of our small and medium sized businesses but they need the tools to succeed. That's why Intuit is supporting PopUp Britain and supplying these ambitious businesses with Intuit Pay, the latest mobile payment technology, so that they never miss a sale." The scheme is also being supported by leading high street retailer John Lewis, which is supplying £ furniture and expertise."